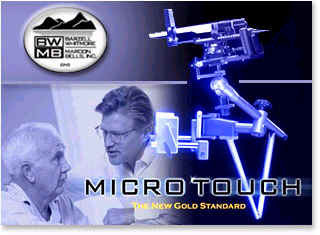 The Micro-Touch™ LP is specifically designed for use on cystoscopy tables with a fixed fluoroscopy/X-ray gantry. The Micro-Touch LP attaches to tables opposite the gantry and allows users to perform simultaneous fluoroscopy/X-ray and seed implantation while retaining the remarkable versatility of the Micro-Touch ultrasound platform and needle guidance system. Zero-gravity feel with unique weight compensator allows unencumbered linear movement necessary for the linear movement necessary in Fluoroscopy aided Brachytherapy. 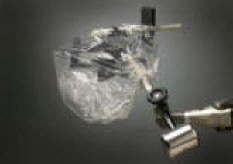 Rapid fixation and locking with single knob turn allows surgical autonomy of the practitioner. The AccuCARE Micro-Touch LP (low profile) is specifically designed for use on cystoscopy tables with a fixed fluoroscopy/x-ray gantry. The Micro-Touch LP attaches to these tables on the side opposite the gantry and allows the user to do simultaneous fluoroscopy/x-ray and seed implantation or biopsy while retaining all the best characteristics and the remarkable versatility of the Micro-Touch® ultrasound platform and needle guide system. Lightweight freehand adjustment, micro-adjustment in every plane and about every axis and an ergonomic configuration allows the user complete freedom to move the patient under the fluoroscope and x-ray during the implant without the loss of position of the instruments or interference with the table. The drape provides a protective barrier for AccuCARE products, including the AccuCARE Stablilizers and Positioners during implant procedures. This sterile, single-use drape applies easily to achieve a broad sterile field for implantation after set-up, saving on clean-up and prep time. The clear material allows for easy identification and manipulation of AccuCARE instruments.